A Bronze Age Boat Channel Challenge? A FAILED CHALLENGE TO CROSS THE CHANNEL IN A BRONZE AGE BOAT! 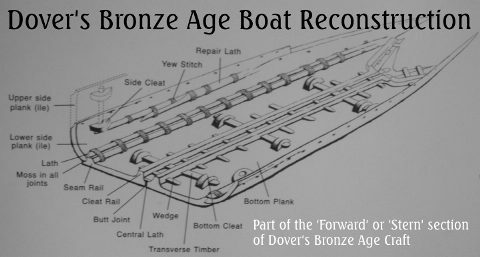 It was planned if conditions are just right a Channel Challenge of a type that could have taken place in the Bronze Age, might take place when a model craft is make based on the Dover Bronze Age Boat find found in September 1992, while digging road works in the junction of Beach Street and Townwall Street six meters below Dover’s ground level. A reconstructed Bronze Age craft of the type that was found in Dover. 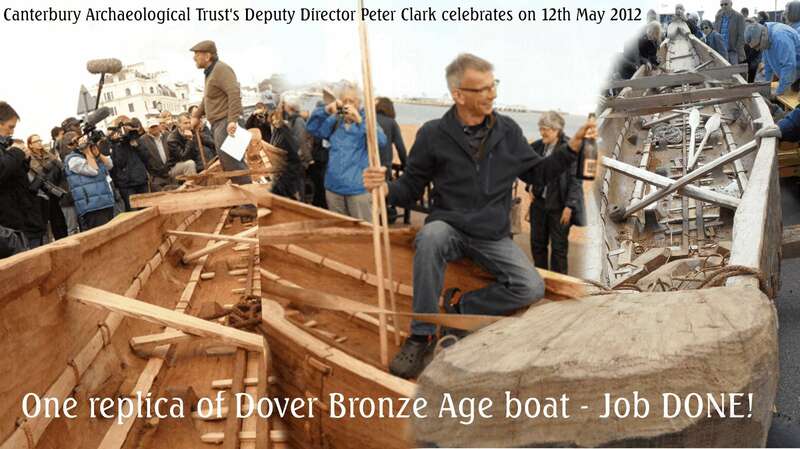 (On 12th May 2012 when Canterbury Archeological Trust's idea for a reconstructed Bronze Age craft was put into the water it was found to sink). The craft is claimed to dated to 1575-1520BC. Around half of the craft was removed and around half still remains in situ, intact, unseen, and mostly untouched. 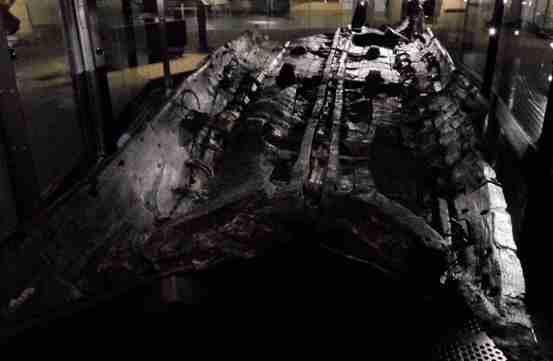 The end of the craft has been seemly robbed out, possibly reused in the building of a similar craft. Without the whole vessel, there is some disparity and conjecture as to whether the find is the rear or the front section. 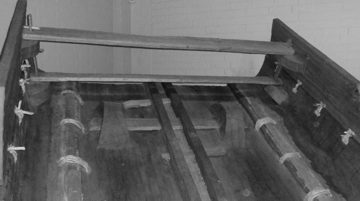 The incomplete remains of this craft give no exact identification to the type and extent of the planking above the water line, nor can the overhaul length be known until the remaining section is excavated. Canterbury Archaeological Trust built a half scale model of the type of craft they think it may have looked like. It is suggested that it would take five men around 18 weeks to construct around 6,000 man hours, at the cost of seemly the major part of £1.7 million European project funding. It was first thought that the reconstructed craft with around 16 crew equipped with paddles, will attempt to cross the channel to Boulogne in June 2012, during a long window of calm conditions of around five hours or more. When the craft was found to sink the plans have changed and the craft was taken by ferry to Boulogne instead for 27th June 2012. The reconstruction craft was built on the lawn adjacent to Dover’s Discovery Centre during February to May 2012. 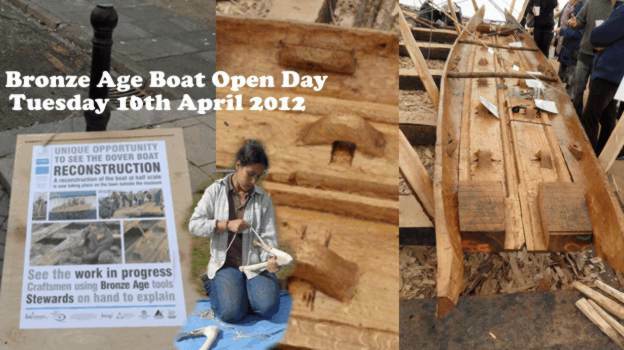 Saturday 12th May 2012, the £1.7 million half scale model of a Bronze Age craft failed the float test in Dover. The replica craft was taking on water as it was being lowered into the water. The model was lifted out and brought around on a trailer to the celebrations to name the model as "Ole Crumlin-Pederson", after the Danish expert who died in October and was involved with the £1.7 million project. 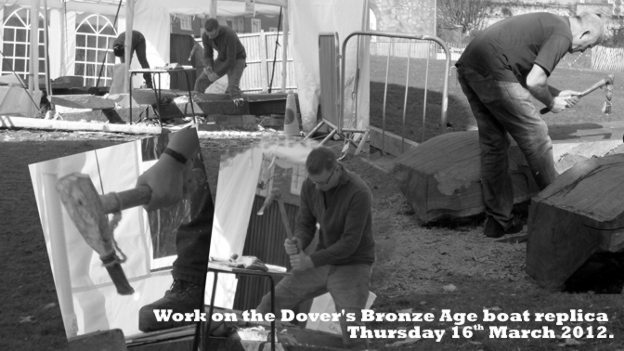 Meanwhile, during 2012 another replica Bronze Age boat challenge being built the western end of the Channel. Cornwall’s recreation of a Bronze Age boat was reconstructed as part of a collaborative project with the University of Exeter and the National Maritime Museum Cornwall in Falmouth. The boat weighted five-tonne, and measuring 50ft (15m) in length and named ‘Morgawr’, meaning "sea monster" in Cornish. This craft took to the water on her maiden voyage on 6th March 201, - and it floated! Click on the picture below for link.